With the launch of Boehringer's Syrum, and other significant developments in digital, one word that keeps cropping in pharma marketing is 'gamification'. But where did this term come from and what does it actually mean? Nick Pelling, an English programmer, first coined the term in 2004 as part of his work with consultancy business Conundra. However, the principles are based on basic game design that has been around for centuries. We have all played Monopoly – a game first created in the early 1900s, which has sold 275 million copies. And in a more up-to-date context, Angry Birds – an app game first launched in 2010 – has been downloaded more than a billion times across all available platforms, and Draw Something for mobile was downloaded 20 million times within five weeks of launching. By 2015, it is estimated that 50 per cent of companies that manage innovation and research will use gamification to drive innovation and engagement. 53 per cent of Facebook users play games. It is in our nature to play games, and to be rewarded by achieving more. This has only been made more evident by the use of mobile and web during the last few years. Gamification is a way of using technology to be more engaging, by giving the user certain actions to complete in return for rewards. It has become popular due to the fact that its principles contain the fundamental human desires, such as recognition, reward, competition, gifting and status. Progress paths – The use of challenges and evolving narratives to increase the likelihood a task will be completed. Feedback – Instant feedback on the user's actions. In business this is usually slow, however in gamification you need to feedback in real-time to help the user on their journey. Rewards – Think of the best way to give the user a pat on the back, such as a target they can increase. This can include power, leadership or responsibility. User experience – In 2012, there is no excuse to for users to be unsatisfied with how a game looks or functions. Develop engaging, straightforward graphics and an intuitive interface that helps users on their journey. Social elements – The social viral loop has to be built into your platform. For centuries, games have been played with friends and family, and gamification and social media help to amplify this. Think about the ability to challenge people or have the ability for the user to boast about their score via Twitter, Facebook and other social platforms. A great example of gamification that contributes to society is the Recycle Bank. First launched in the UK by Royal Borough of Winsdor and Maidenhead, residents receive points for recycling waste that can be redeemed against vouchers to spend on the high street. In the US, Zamzee is tackling obesity by using gamification to get people off the couch and to lead a healthier lifestyle. Just imagine a solution like this for people with diabetes or in improving adherence programmes. The UK's Department of Work and Pensions is also making use of this trend by challenging its workforce to come up with new ideas using a website called Idea Street. The site includes points and leaderboards, offering staff a reward for good suggestions. Following these examples, gamification offers the pharma industry more than just one-off campaigns; we could use it for compliance training, research with sales reps, internal staff training and innovation. We could even involve websites for healthcare professionals (HCPs) and use game design principles to engage, educate and up-sell HCP's. By adding gamification to various marketing and business initiatives we can educate, engage and enhance our customers and their customers experience with brands. 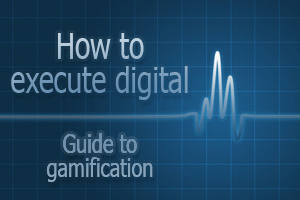 And with centuries of history behind it, gamification is in our nature, it is not just a buzzword. Pharma companies already leading the way in gamification include Boehringer, with its aforementioned Facebook game Syrum, which challenges players to run their own pharmaceutical company and develop drugs to combat a range of deadly diseases. And earlier this year, Janssen launched an iPhone app for UK patients living with ADHD, which adds a point scoring element to help motivate patients to keep improve the organisation of their day-to-day life. Faisal Ahmed is part of the marketing team at plotr - a not for profit enterprise formed by industry and backed by government as online platform for career inspiration and preparation for 11-24 year olds. Ahmed was previously part of the start-up team at Amazon, and was later responsible for digital strategies at 90 football clubs, the England and Wales Cricket Board and the World Rally Championship. He was also previously head of digital at Langland, winning over 30 awards for his digital work, and head of digital at Life Healthcare Communications.